What did that say?!? Root Beer? In pancakes? You betcha! 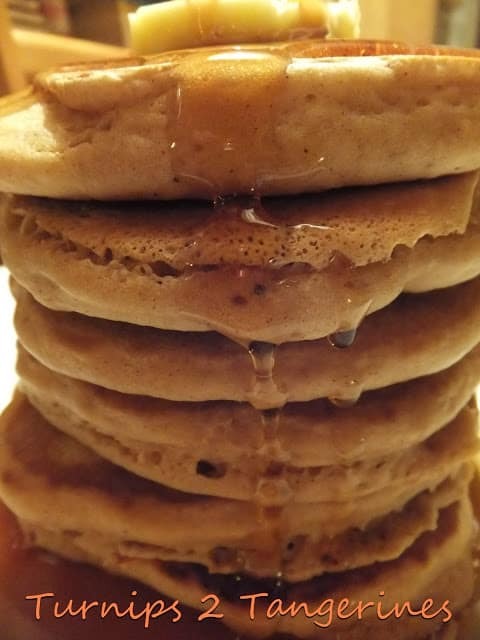 Root beer chocolate chip pancakes are for kids and adults alike. 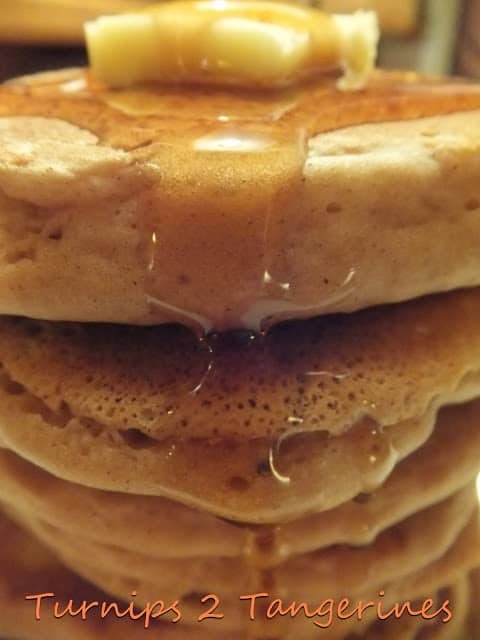 The root beer in this recipe adds a unique flavor to the pancakes and the carbonation makes the pancakes light and fluffy. As for the chocolate chips, well everyone loves chocolate so why not add some to your pancakes too. A small amount of pumpkin pie spice is added to the batter for an added taste bonus. Do your kids like pancakes for dinner?? 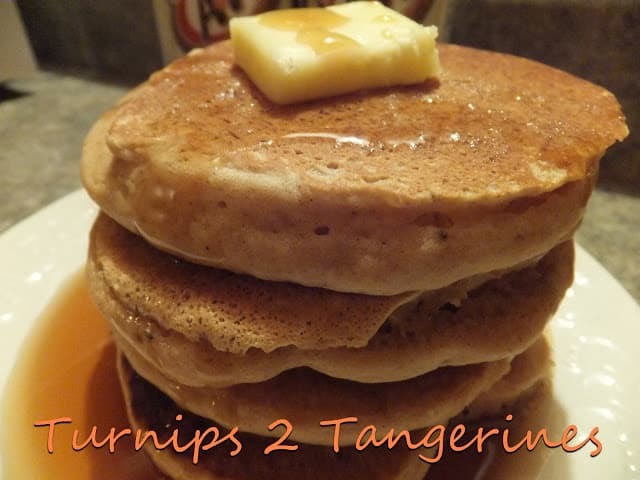 Next time they want to have pancakes for dinner, give this recipe a try. When my kids were young, about once a month we would have breakfast for dinner. Sometimes it would be bacon and eggs, or french toast and sausages, while other times we would have pancakes or waffles. One night the kids wanted pancakes for dinner and the rest is history. More often than not, I have a complete pancake mix on hand. In fact, it’s not often that I don’t have a complete pancake mix in my cupboard. I usually have a Belgium waffle mix on hand too. Even though its easy to make a pancake or waffle mix from scratch, I like the convenience that they both offer. For the few dollars that it costs to purchase a pancake/waffle mix and some water/root beer, you can have pancakes anytime. There are a lot of flavors going on in these pancakes. Root beer, chocolate and pumpkin pie spice. Stir together flour, sugar, baking powder, salt, baking soda, and pumpkin pie spice. Combine egg, root beer and oil; add all at once to flour mixture, stirring until well blended, batter with be thick. Let batter "rest" 5 minutes. Stir in mini chocolate chips. Pour batter onto a hot, lightly greased griddle or heavy skillet. Cook until golden brown, turning to cook other side when pancakes have a bubbly surface. Wanted to let you know I've come across the pecan liqueur on amazon. We have pancakes for dinner now and then–my son loves that. He also is a huge (and I mean HUGE) root beer lover. He would flip out over these any time of the day. Thank you for sharing with See Ya in the Gumbo, Lynn. Hi Linda~ Thanks for dropping by and thanks for the invite! I will check out What to Do Weekends Party! Have a Great Week! Thanks for visiting Turnips 2 Tangerines~ I'm glad you stopped! Thank you Wanda for visiting~ I will be sure to stop by on Tuesday, Thanks! These look fun and yummy. Thank you for stopping by Memories by the Mile. Be sure and come back Tuesday for my link party.